On Saturday, February 22, Monkey Jungle in Miami will host an “African Ape Awareness Festival” featuring talks by conservationists, dance and drama performances, and a fashion show. The goal of the festival is to raise awareness of endangered chimpanzees and gorillas in Africa. But there is one African ape closer to home who deserves greater public awareness. For 25 years a gorilla named King has lived a solitary existence at Monkey Jungle. Of the approximately 360 gorillas in zoos in the United States, King may be the only one who lives alone and who has no prospect of ever having a companion*. In March 1989 a female gorilla named Mitzie died at Monkey Jungle. Since then, King has remained alone–despite the efforts of animal advocates. In 1997, a campaign was launched to persuade Monkey Jungle to send King to Zoo Atlanta, where he could be with other gorillas. But despite Zoo Atlanta’s invitation and pleas from noted primatologist Jane Goodall and thousands of Florida residents, Monkey Jungle refused. Instead, after languishing for years in a concrete-and-bars cage, in 2001 Monkey Jungle built a naturalistic enclosure where King is at least able to feel the sun and breath fresh air. Although the larger enclosure was an improvement, it is unclear how much time King actually spends in the enclosure, and Monkey Jungle continues to ignore the issue that King is alone. Gorillas and other apes are intelligent animals with complex social and emotional lives. During King’s daily shows at Monkey Jungle, he performs degrading tricks such as the Hokey-Pokey for the amusement of tourists. King will turn 45 this year. *Monkey Jungle lost its American Zoo and Aquarium Association-accreditation years ago and therefore does not qualify to receive another gorilla. 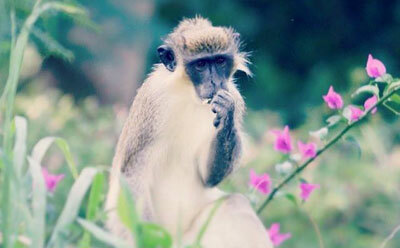 An end to the cruel primate trade in St. Kitts? According to preliminary U.S. Fish and Wildlife Service records, in 2013 there was not a single monkey exported from St. Kitts & Nevis into the United States. With this unexpected good news, ARFF is renewing our call for a permanent end to the export of wild monkeys for experimentation. St. Kitts & Nevis is one of only a handful of countries, including Barbados and Mauritius, that allows the trapping and export of wild monkeys for use in laboratory experimentation. You can Help! Please contact the Prime Minister and politely ask for a ban on the export from St. Kitts & Nevis of monkeys destined for the research industry. Please send a copy of your comments to the St. Kitts Tourism Authority. Visit Stolen from Paradise.com for a sample letter and to learn more about ARFF’s campaign.